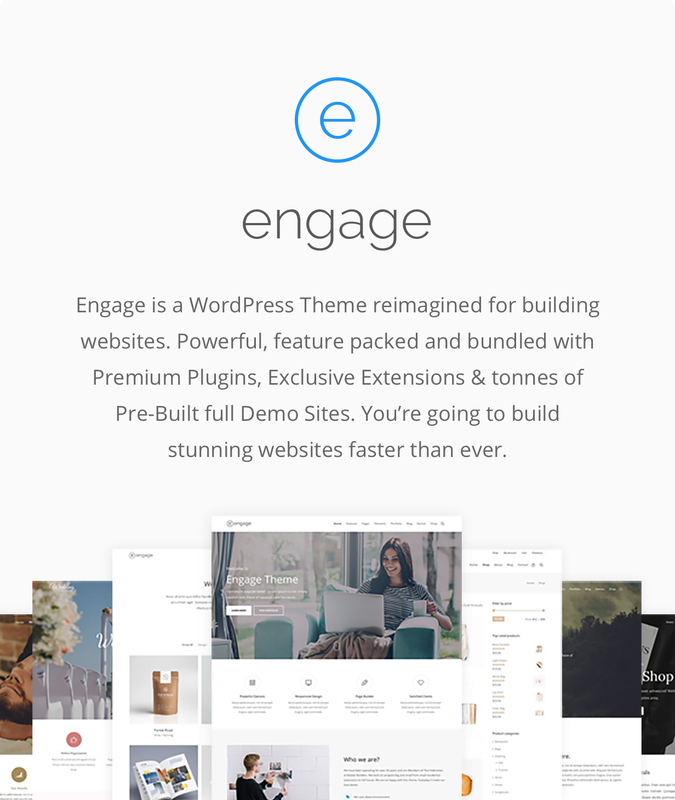 Engage is WordPress reimagined for building websites. Powerful, feature packed, bundled with Premium Plugins & tonnes of Pre-Built Demos to get you started. Complete list of prebuilt demos available here are absolutely, no kidding, one click. Simply preview and select the one you like the most during the Import and Activate Theme process, and you will be up and running in no time. Most demos are installed in under 5 seconds! You can even select Content and Styling from different Demos to create something really unique using multiple selections of the available demo content for ultimate flexibility. Mix and match to your heart’s content! Since the 2.0 update, Engage comes with a brand new way to import demo content to your site. Now, along with the full Demo Sites importer (that allows you to import a full Demo Site), you have an access to the incredible new feature “Demo Pages”. It allows you import pages from any Demo Site individually. Let’s say that you love our “Business” Demo Site. You decide to import it. But then again, you would like to use the layout of “Services” page in the “Agency” demo. Now, you may import only THAT specific page – without getting bloated with other posts and content. Awesome! We are talking about Visual Composer of course! 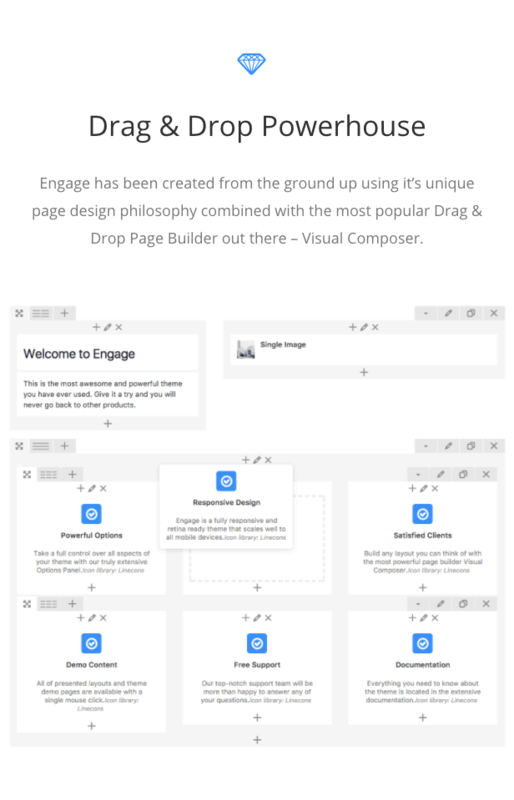 But not just VC, Engage has been created from the ground up using its unique page design philosophy combined with a unique extension crafted by Team Veented called ‘Engage Templates’. With these two elements at the core of Engage, you can forget about staring at a blank page ever again… select from a huge library of over 120 predefined templates that give you a strong foundation of building blocks to start with, where you take it from there is up to you. From where-ever you are editing, click ‘Add Template’ browse the extensive library, click ‘Load Template’ and the entire selection is imported directly into the page you are editing. It’s so simple and elegant it’s hard to get your head around. Once you have chosen a demo and imported some content of your own it’s time to start tweaking! Most of what you need to update will either be done in two places, either inside a Post where you edit content and upload images etc, or you wish to modify style, structure and form function. This can be done easily and on the fly from the Theme Options Panel. It gives you access to general settings like Typography and Social Profiles, as well as many more advanced settings like the myriad of Header settings, Logo, Sidebar and Social Profiles. Everything is done right there, without a single line of code on your part. Genius – engage. 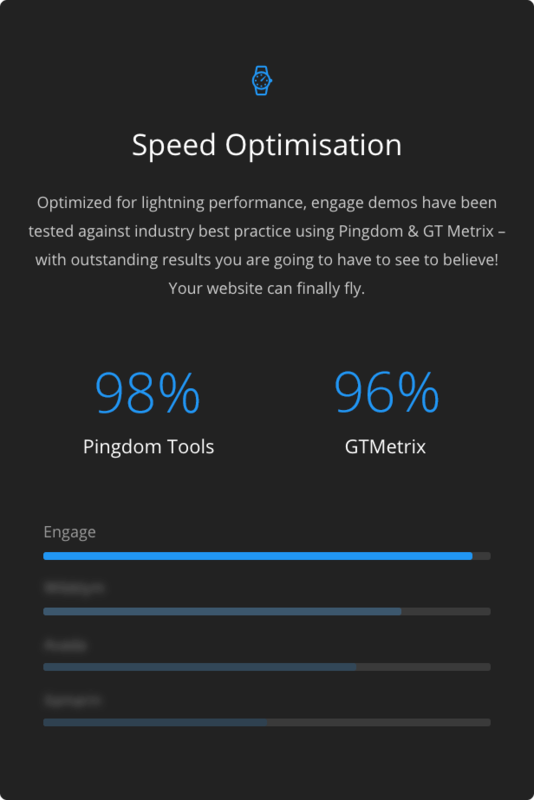 Optimized for lightning performance, engage demos have been tested against industry best practice using tools including Pingdom & GT Metrix – with outstanding results you are going to have to see to believe! Engage has also been supercharged and optimized with the latest coding techniques and strategies for end-user website speed – so your site can truly fly. Do, Be, Extend, Achieve, Inspire. These are all superlatives that spring to mind when thinking about the possibilities with Engage and the extended functionality these powerful plugins bring to the table. Bundled with your purchase and easily activated during the installation process you have at your fingertips to create amazing slider animations, crazy grids of any sort and elegant forms that will make your heart sing. 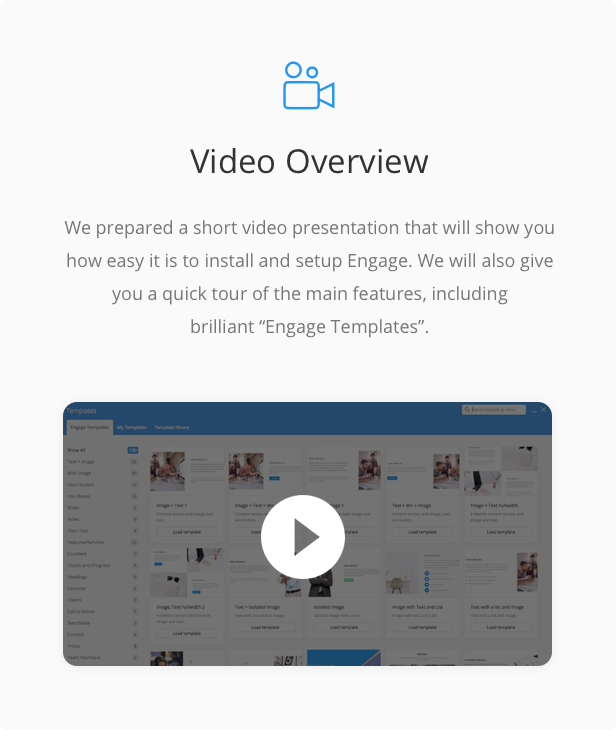 Engage comes with a blistering fast setup wizard that is not only truly one click, but so quick at importing demos and getting you up and running it truly must be seen to be believed. The Engage setup wizard will walk you through step-by-step the full installation process including Plugins and then guide you through the demo import should you chose to use it. It’s intuitive, clean, and fast. We promise! When you buy Engage you gain access to literally hundreds of web elements that have been meticulously designed for modern websites. From elegant map solutions that include visual markers with colour palettes to suit any design, to buttons with icons, smooth edges, sharp edges and icons to boot – Engage has you covered. These have all been carefully crafted to fit the visual aesthetic of the theme so that all you have to do is decide what you put and where, the rest is taken care of. 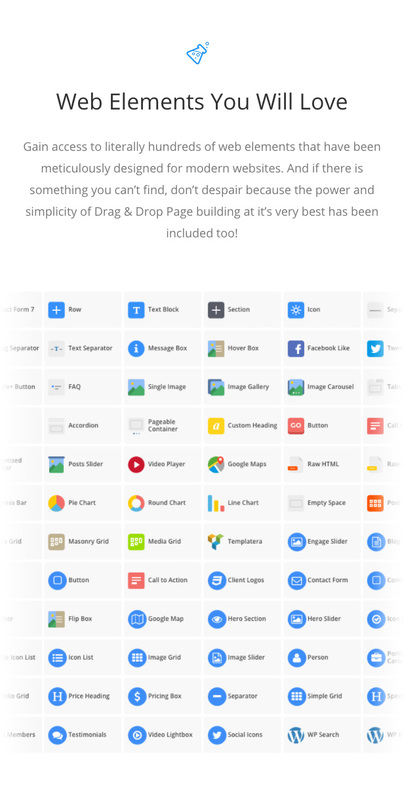 And if there is something you can’t find, don’t despair because the power and simplicity of Drag & Drop Page building at it’s very best has been included too! There is something really fabulous about a well designed Header, don’t you agree? A beautifully crafted, elegant and intuitive Header design says to a customer ‘Come in, take a look around, I’m all about you and I’m easy to use’. Whether you want something basic like a top bar or sidebar, you can take it up a notch with alignment, split or overlaid. Select your header skin, font family, spacing and social icons. It gets deep before you really even know it, and it’s all easy to access from the Theme Options panel. Like a really good cake, you need to bake your website with WooCommerce functionality at its core these days, so the results exceed your expectations. Which is exactly how we treated Engage. 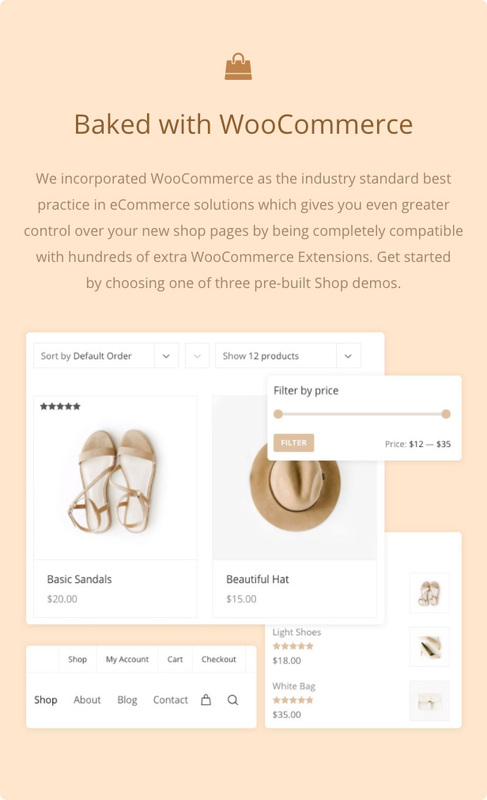 Looking at it from the customer’s perspective, we incorporated WooCommerce as the industry standard best practice in eCommerce solutions which gives you even greater control over your new shop pages by being completely compatible with hundreds of extra WooCommerce Extensions. Boring shop front – goodbye! Built-in Contact Form – theme comes bundled with a simple contact form – no external plugins required! Full Contact Form 7 plugin support. Page Settings – metabox window available while editing/creating a page/post and allows to individually style some aspect of that post/page. 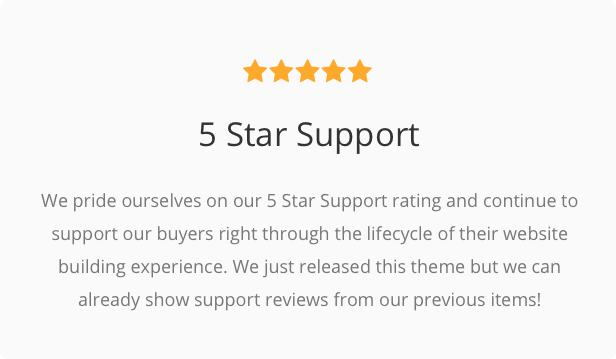 We pride ourselves on our 5 Star Support rating and continue to support our buyers right through the lifecycle of their website building experience. 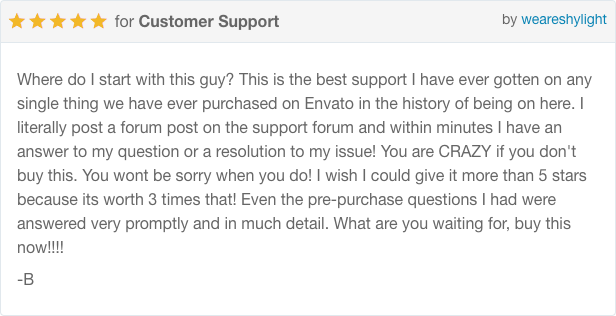 We offer free technical support to every buyer and a simple log-in access to a modern support centre with your Envato sign on. Extensive knowledge base and private or public tickets give you full access to support staff so you can get the answers you need – fast. 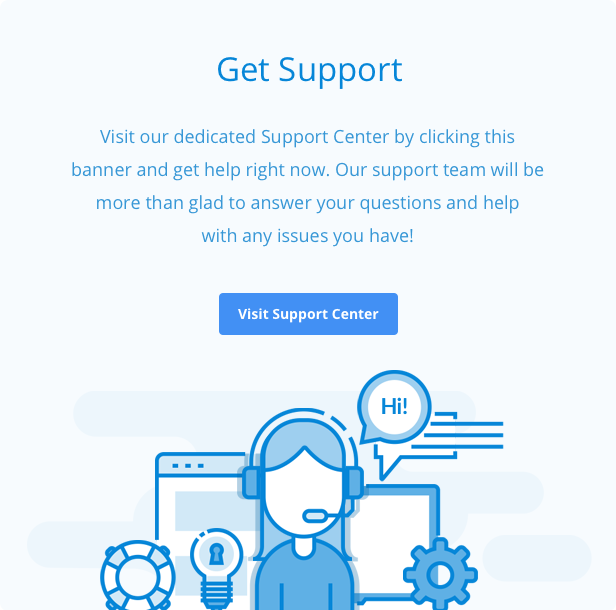 Visit our Support Center now! create portfolio, blog, contact page, configure contact form, google maps and so much more! See all videos here. If you’re looking for a premium WordPress (or web in general) customization services then you found the right place! We’ve just launched a new, dedicated branch of our company for that: Veented Studio. 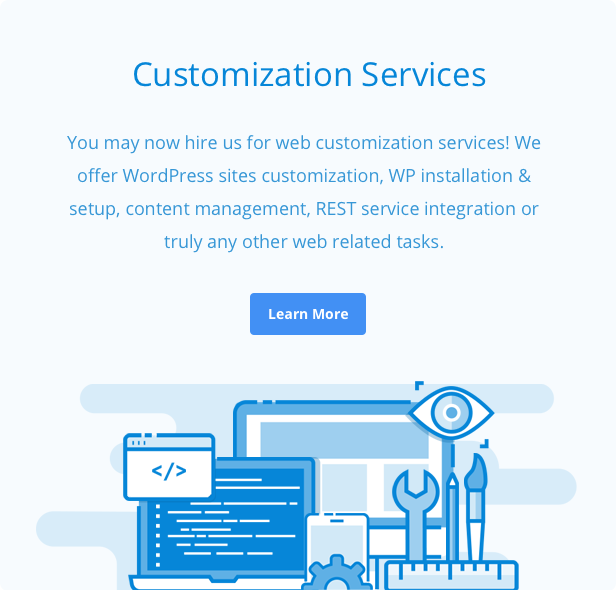 You may now hire us for any web related task including WordPress (or any other platform) site customization, WordPress installation & setup, content management, REST service integration or truly any other web related tasks. Please visit the Veented Studio website studio to learn more about our services and pricing! Updated: WPBakery Page Builder, Engage Core plugins. Added: GDPR consent checkbox to the theme default, basic Contact Form – can be disabled in Theme Options / Contact Page. 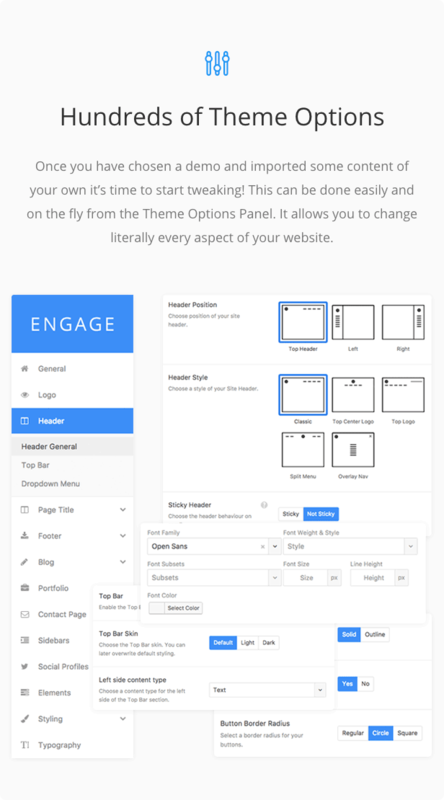 Updated: WPBakery Page Builder, Revolution Slider, Essential Grid, Engage Core plugins. Added: An option to enable comments count in the single blog post meta section (Theme Options / Blog / Single Post). Added: “Website URL” field to the post comments form (along with a new string to translate under Theme Options / Translate). Added: Cookie consent checkbox to the post comments form (GDPR ready). Added: New menu location “Top Bar Right” so it’s now possible to have two separate menus in the Top Bar area. Added: An option to disable the Page Title area on the search results page and archives individually (Theme Options / Archives). Updated: WPBakery Page Builder plugin is now hosted on insanely fast and secure AWS S3 storage. The theme zip file is now over 6mb smaller! Fixed: New lines of text in the Biography section of the Person element now work properly. Fixed: Parallax effect blocking vertical scroll on some mobile devices. Fixed: Single blog post author wrong link. Fixed: Page subtitle font size option not affecting the frontend. Fixed: Portfolio grid hidden items issue. Fixed: WooCommerce shopping cart variation label styling issues. Fixed: Navigation shopping cart height issues when displayed on smaller devices. Fixed: Page Title parallax issue. Fixed: Google Maps marker is now not draggable by default. Updated: Revolution Slider, Essential Grid, Engage Core plugins. Fixed: Hero section background overlay not working properly when a “custom color” is selected and the alpha level is reduced. Fixed: Body font color not reflecting changes from the Theme Options panel. Fixed: Icon list element wrong values. Fixed: Automatic theme updates issues when a child theme is activated (no notifications). Updated: Visual Composer, LayerSlider, Essential Grid, Engage Core plugins. Added: You may now control the height of the Page Title area on Tablet and Mobile devices (Theme Options / Page Title / Page Title Responsive). Added: Missing WooCommerce related translation strings in Theme Options / Translate. Added: New options to fully configure the single blog post meta section. You may now enable/disable the Author, Date and Categories part individually in Theme Options / Blog / Single Posts. Added: An option to globally set the Page Title background image of blog posts to be the Featured Image (Theme Options / Blog / Single Posts / Extras). Added: New “Telegram” social icon (Social Profiles tab and shortcodes). Added: Email social icon in Person and Social Icons shortcodes. Fixed: Icon List text description now outputs basic HTML (span, br, anchor tags) with a “class” attribute. Fixed: WooCommerce RTL related issues. filter by taxonomy (category), set a proper order, number of posts and you’re good to go! Added: A video lightbox (popup window) action for the Button element, Hero Section buttons and Engage Slider buttons. Just insert a YouTube or Vimeo video URL and a video popup window will appear after clicking the button. Added: New filters to easily customize the Page Title. You may now define a particular page title for a specific post type or page using “engage_filter_page_title” and “engage_filter_breadcrumbs_page_title” filters. Added: New Footer Widgets layout – 1 column. Added: An option to disable the Footer Copyright area completely (Theme Options / Footer ). Added: Houzz social icon in Theme Options / Social Profiles and Social Icons web element. Added: An option to enable the Top Bar on mobile devices and choose the content alignment in that state (Theme Options / Mobile Header). Updated: Contact Form 7 radio and checkboxes inputs styling. Updated: Engage Core, Layer Slider, Revolution Slider plugins. Fixed: Easy translation issues with particular strings (Previous project, View All). Fixed: Engage Dashboard menu item is now hidden for users without sufficient privileges. Fixed: Engage Slider autoplay issue. Added: New web element “Single Event” for The Events Calendar and The Events Calendar Pro plugin. It allows you to easily display a single event view (the event featured image and a short excerpt along with a countdown) anywhere on your website. If you have The Events Calendar plugin active, just add the “Single Event” element using the Page Builder. Added: An option to easily disable any custom post type added by the theme. Updated: Image size on the single event page (The Events Calendar plugin). Updated: Layer Slider and Engage Core plugins to the latest version. Updated: The “Team Members” custom post type is now by default disabled. Added: New Theme Options tab “Translate” that allows you to easily translate frontend theme strings, like contact form labels, post meta fields, portfolio labels etc. No need for a translation plugin anymore! Just visit the Theme Options / Translate tab. Added: A possibility to modify number of heart likes in portfolio posts (Portfolio Post metabox tab). Fixed: Link post format issues. Fixed: Fullscreen page title issue. Fixed: Contact details widget mobile phone not displaying properly. We recommend to update the entire Engage theme and Engage Core plugin for maximum compatibility. Added: New, beautiful Demo Site “Business 2” with three homepage concepts and 6 subpages. Added: New “Content Box” tab in Theme Options / Elements menu with typography controls for the Content Box element. Added: New paragraph font sizes available in the “Text” element: larger, xlarge, xlarger. Added: Sticky mobile header – you may now set your header to be sticky on mobile devices! Visit Theme Options / Header / Mobile Header to turn the option on. Added: New mobile header layout options under Theme Options / Header / Mobile Header. You may now set your mobile header to have a centered logo and/or move the search icon to the left. Added: New Google Map pin icon – you may now use a default Google Map pin icon on our Google Map element. Updated: The “Mobile Nav” tab in Theme Options panel has been renamed to “Mobile Header”. Fixed: Mobile issues with the “Split Menu” header layout. Fixed: Google Map markers icons and multiple instances issue. Fixed: Wrong Theme Options URL in the admin bar quick access menu when a child theme is activated. Fixed: Content top padding not adjusting when header height is changed. Added: An option to disable the “fade out” transition effect when a navigation link is clicked (Theme Options / General) – the effect is now by default turned off. Updated: Revolution Slider to the latest version. Fixed: Automatic updates issue when a Child Theme is being used. Fixed: Page title height set in Theme Options issue. Added: New, beautiful Demo Site “Creative Agency” with two homepage concepts and 6 subpages. Added: New “Special Heading” tab in Theme Options / Elements menu with typography controls for the Special Heading element. Added: New “Call to Action” tab in Theme Options / Elements menu with typography controls for the Call to Action element. Fixed: Logo Carousel images imported with a Demo Site or Demo Pages not being displayed properly. Added: Full Gravity Forms plugin support! You may fully customize the looks of your gravity forms via Theme Options / Styling / Forms. Added: New “Label Typography” option field in Theme Options / Styling / Forms to fully customise your forms label (Gravity Forms & Contact Form 7). Added: Engage Slider slides has received two additional CSS classes for easier selection: “slide-nr-X” (X – number of slide in a current slider) and “slide-id-Y” (Y – unique ID of the slide post). Updated: WPBakery Page Builder (Visual Composer) to the latest version. Updated: Increased default font size of form inputs to 16px. Fixed: PHP error when a Templatera plugin is installed separately. Fixed: an error when a wrong Google Maps API key is provided. Added: New, beautiful creative demo site “Portfolio Minimal 1” with a very minimalistic approach. Added: New, beautiful creative demo site “Portfolio Minimal 2” with a side header. Added: Options to fully customize the Portfolio Post Navigation area: you may now adjust the typography, choose the type of content (label, title or both), modify the spacing and more! Available in Theme Options / Portfolio / Portfolio Styling. Added: New navigation button style – outline (new CSS class “nav-button-outline”). For more details please visit the Knowledgebase! Updated: Layer Slider plugin to the latest version. Updated: On single blog posts, if the author section is enabled and no biographical information is provided, only the author name is display now (instead of a notification about a lack of biography). Fixed: Visual Composer plugin updates via Appearance / Install Plugins or Engage / Plugins tab work perfectly fine now and no “license key required” false message is displayed anymore. Fixed: Portflio single post global Theme Options not affecting portfolio posts. Fixed: Blog masonry number of columns not affecting the blog index page properly. Fixed: Blog masonry style item spacing issue. Fixed: Side header submenu links colors. Added: A native theme option to display WPML language switcher next to site navigation elements. The switcher is also visible on mobile devices. Added: A new sticky header option – “Sticky Appear”. The header is initially fixed but a sticky header appears after scrolling a certain amount of pixels. A live example can be seen in the “Business” demo site. 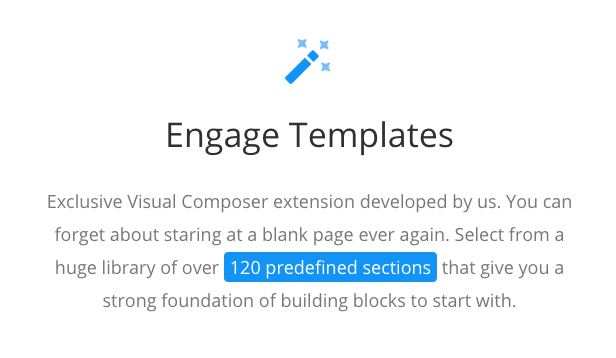 Updated: Visual Composer plugin to the latest version. Updated: Essential Grid plugin to the latest version. Updated: Revolution Slider plugin to the latest version. Updated: The “Theme Options” admin bar link to was moved to a dropdown menu of the “Engage” element. Updated: Default font size of the site navigation was increased from 15px to 16px. Updated: Default font size of the Top Bar was increased from 13px to 14px. Fixed: admin bar “Engage” element not displaying a dropdown menu with quick links. 14 November 2017 – 2.0 – First BIG update! 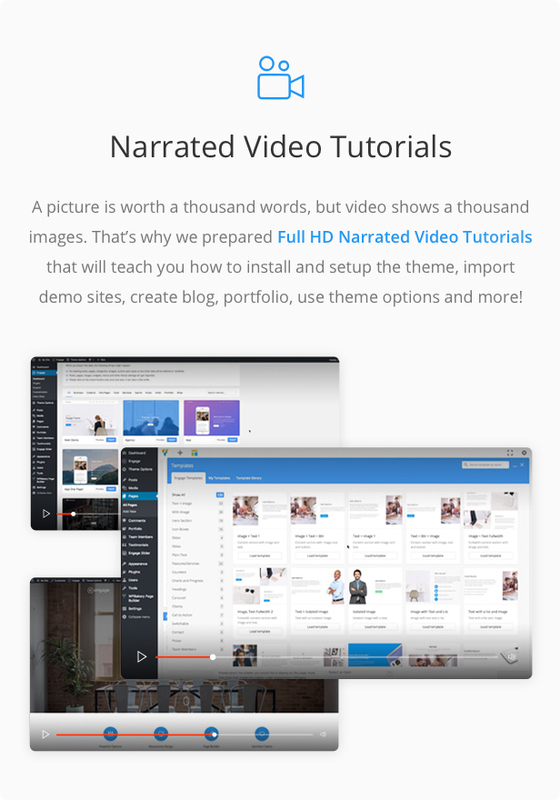 Added: Demo Pages – brand new way to import demo content to your site. Demo Pages allow you to individually import pages from ANY Demo Site available. Example: you decided to import the “Agency” demo as a base for your website but you like the layout of the “About us” page from the “Cafe” demo. Now, you may import that specific page without bloating your website! Awesome! Added: Automatic Theme Updates – yes, they are here! You may now automatically update the Engage theme without a need to copy/manage files manually. Just visit the Theme Dashboard, insert your personal Token (powered by the new Envato API – instructions included) and voila! You will be notified about new theme updates directly in your theme’s dashboard and they will be downloaded directly from secure, Envato servers. Added: New Demo Site Business. Added: New Demo Site Architecture. Added: New “Top Heading” field in Engage Slider. Added: An option to choose accent color in VC Icon element (as background and color). Added: Full typography settings for breadcrumbs in Theme Options / Page Title / Breadcrumbs. Updated: Premium plugins are now stored on insanely fast Amazon S3 storage. Updated: Main demo now comes with the “Engage Slider” example included with Home 1 layout. Fixed: Sticky header border/shadow issues when using a transparent header layout. Fixed: Flip boxes display issue. Fixed: Font rendering issues on Safari browser when using a certain typography configuration. Added: New web element “Contact Details” – a simple icon/text list for contact purposes: address (that can be linked to a Google Map), two phone numbers (open a phone tool) and two email addresses (open an email client). Added: An option in “Client Logos” element to open links in a new tab. Added: An option in “Client Logos” to increase logos height in case of vertical images. Updated: Contact related Engage Templates have been updated to the new “Contact Details” component. Updated: “Veented Contact Details” widget now supports phone number links. Fixed: Dark mobile header issues on mobile devices (wrong background color). Fixed: Wrong URL for images imported with few Demo Sites. Fixed: Portfolio Mosaic layout minor image resizing script issues. Added: New demo site “Church” with Events Calendar plugin integration example. Added: New demo site “Photography Modern”. Added: Full “The Events Calendar” and “The Events Calendar Pro” plugin support. Added: “The Events Calendar” plugin has been added to the Plugin Manager for easy access. Added: New “Image Grid” element image size – masonry. Added: Row and Column background image automatic optimisation. Added: “Custom HTML” field is now available in Theme Options / Advanced for easy custom code placement before the site’s tag (great for Facebook Pixel, Google Analytics or other scripts). Added: Arrow navigation for Hero Section with image slider as a background. Fixed: Side header mobile issues. Fixed: Top Center mobile issues. Fixed: Column responsive layout issue on vertical tablet view. Fixed: Portfolio grid responsive issue on tablet. Fixed: Hero section video background issue on mobile devices. Fixed: Fixed: responsive issue with hero section subtitle with a custom font size. Files updated: /css/responsive.css, style.css, /framework/admin/theme-dashboard.php, /js/engage.grid.js, /js/engage.main.js, Engage Core plugin.